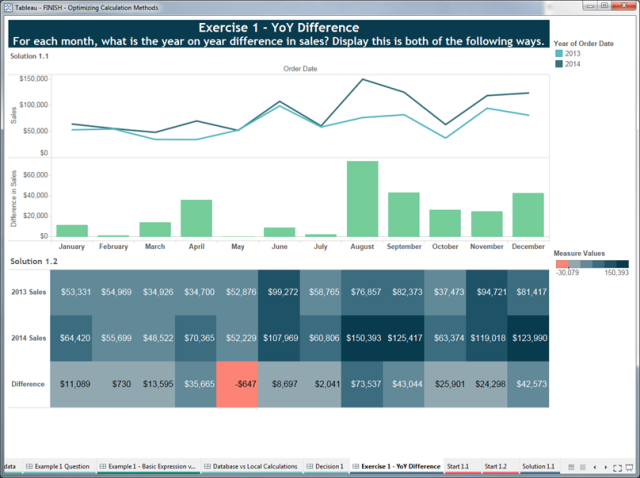 Tableau has multiple forms of calculation. 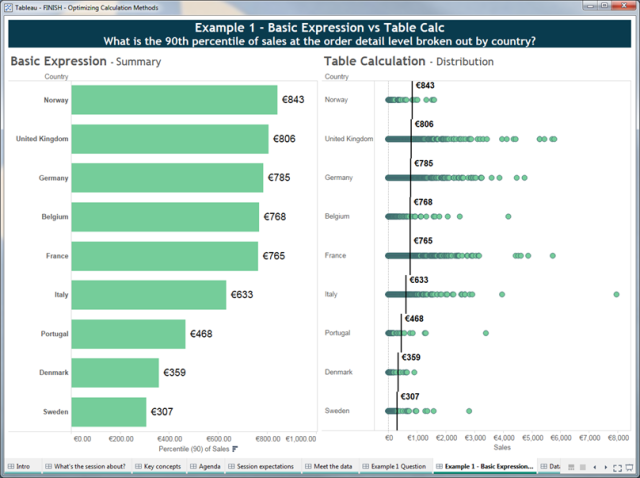 And for those who are new to Tableau, choosing the right type of calculation to employ for a given problem can pose a challenge. 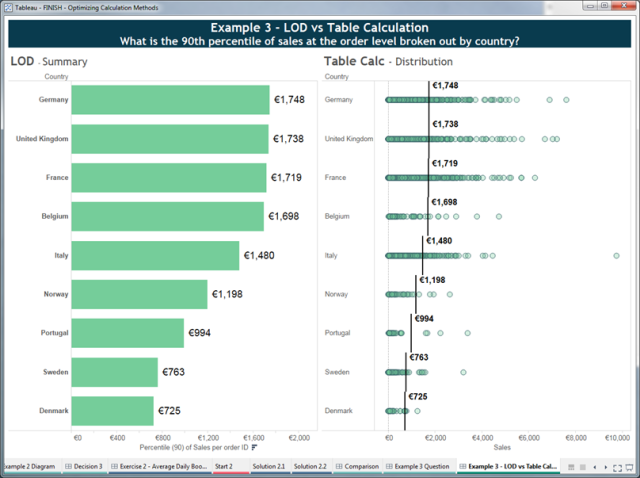 Basic calculations: These calculations are written as part of the query created by Tableau and therefore are done in the underlying data source. They can be performed either at the granularity of the data source (a row-level calculation) or at the level of detail of the visualisation (an aggregate calculation). 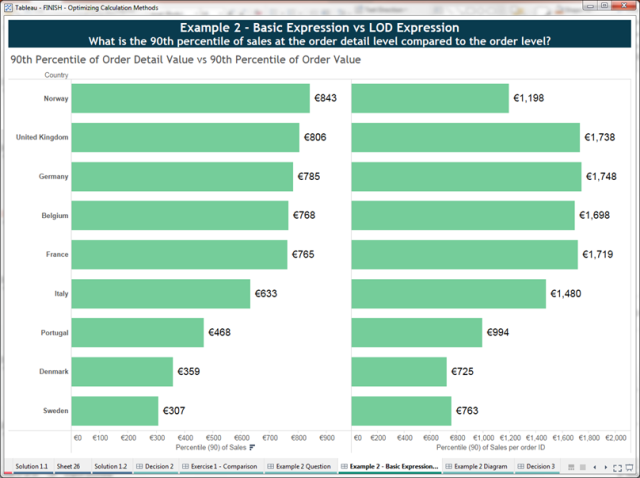 Level of Detail Expressions: Like basic calculations, LOD Expressions are also written as part of the query created by Tableau and therefore are done in the data source. The difference is that LOD Expressions can operate at a granularity other than that of the data source or the visualisation. They can be performed at a more granular level (via INCLUDE), a less granular level (via EXCLUDE) or an entirely independent level (via FIXED). Table calculations: Table calculations are performed after the query returns and therefore can only operate over values that are in the query result set. So how do you choose the right calculation? Let's compare the different calculations types. 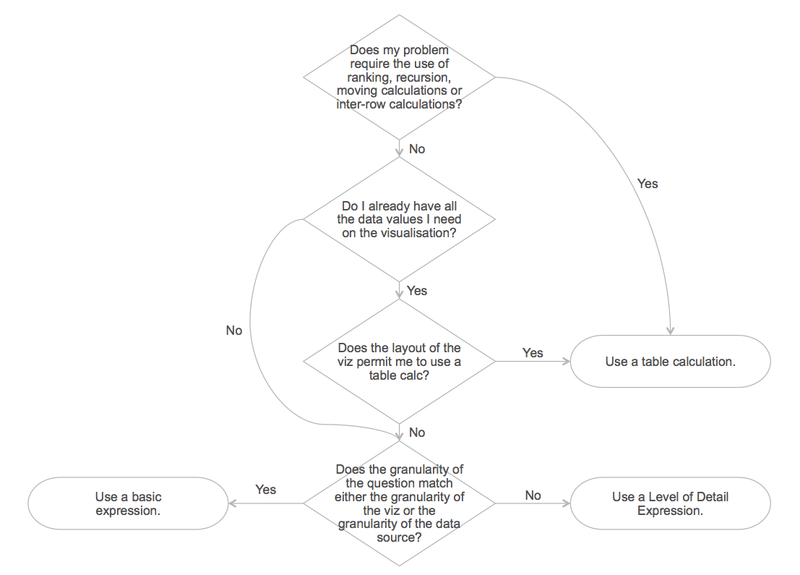 When trying to choose between basic calculations and table calculations, the important question is: Do I already have all the data values I need on the visualisation? If the answer is yes, then you can calculate the answer without further interaction with the data source. This will often be faster as there is less data that needs to be processed (i.e. we are just computing using the aggregated values from the result set). If you do not, then you have no choice but to go to the underlying data source to calculate the answer. Consider the following example in which we ask: What is the 90th percentile of our order details, shown by country? Both sides of this dashboard answer the question. If you were just interested in the 90th percentile value and didn’t need to determine further insights, then the chart on the left would be optimal. It provides a minimal result set (one number per country) via a basic aggregation PCT90([Sales]) which is calculated in the underlying data source. However, if you wanted to gain further insights (e.g. understand the greater distribution and identify outliers) or add other aggregations (e.g. you also wanted the median values) then the chart on the right allows you to do that without further queries. The initial query to return all the order detail records (the green dots) provides all the data necessary to locally compute the 90th percentile as well as explore other insights. One of the key takeaways from this post is that the layout of the viz matters. As we’ve already discussed above, the viz design will impact how much data you initially return from the data source. This is an important factor in determining your approach. However, there are situations where, although you have all the data you need in your result set, it is not possible to achieve the required layout using a table calculation. 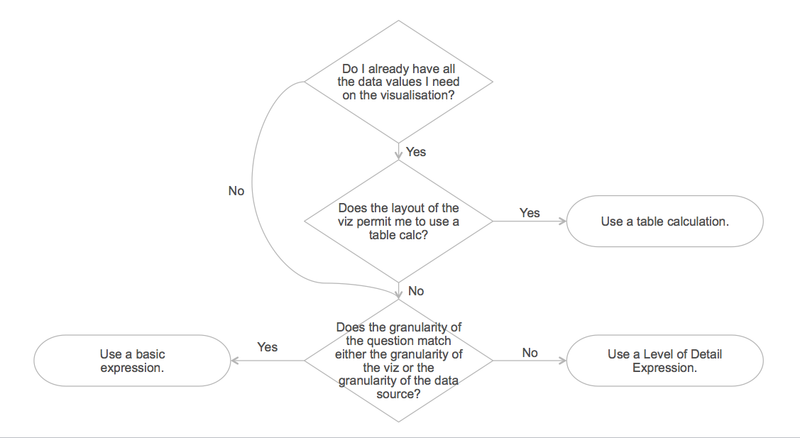 So you also need to ask: Does the layout of the viz permit me to use a table calc? This approach allows you to just have the Measure Names dimension which you can sort to meet the layout requirements. If we do not have all the data we need on the visualisation, we need our calculation to be passed through to the data source. This means we must use a basic calculation or an LOD Expression. But how to choose? The important question to ask here is: Does the granularity of the question match either the granularity of the viz or the granularity of the data source? Basic calculations can be performed either as row-level calculations or as aggregate calculations. So they can only answer questions at the granularity of the data source or at the level of detail of the visualisation. Level of Detail Expressions, on the other hand, can answer questions at any granularity. Consider the following example in which we ask: What is the 90th percentile of sales at the order-detail level compared to the order-total level? This would be correct for the required chart but would limit our flexibility to change the grouping to some other dimension (e.g. by Region or by Shipping Type). Consider the following example in which we ask: What is the 90th percentile of sales at the order total level, shown by country? You will notice that this is almost identical to the question asked in #1 above. The only difference is that the percentile calculation is performed on the order total, not the order detail. You may realise the chart on the left side is in fact the same chart as we saw on the right side in #2. We already know the granularity of this problem is different to the data source and the viz, so we should use an LOD Expression. The chart on the right side is the same as the right chart from #1. However, the dots represent Orders, not Order Details. This is simply done by changing the granularity of the viz (swap Row ID with Order ID on the Detail shelf). Because table calculations keep the calculation logic separate from the computation scope and direction, we don’t even need to change the calculation; just compute using Order ID. It can get tricky to be sure about the answer to our decision-process questions, and sometimes you can solve a problem one way until you later introduce a complication. 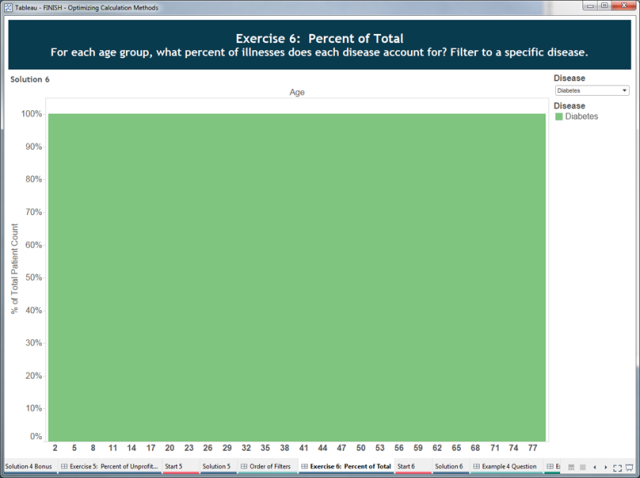 Consider the following example where we ask: For each age group, what percent of illnesses does each disease account for? So the question to ask here is: Does my problem require the use of ranking, recursion, moving calculations, or inter-row calculations? This is because table calculations can output multiple values for each partition of data while basic and LOD Expressions output a single value for each partition/grouping of data. 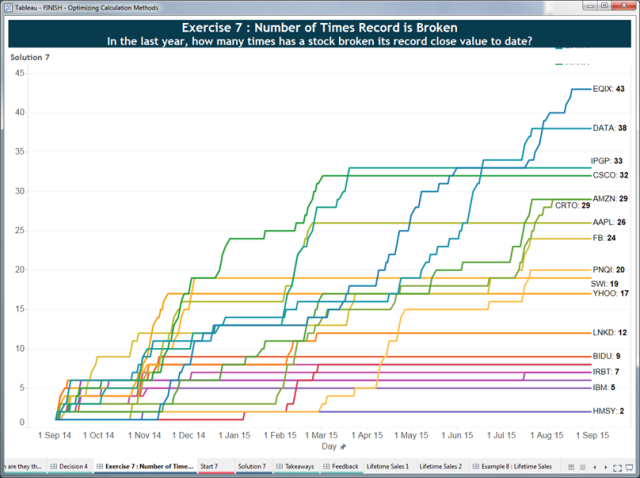 Consider the following exercise in which we ask: In the last year, how many times has a stock broken its record close value to date? There is no silver bullet. The answer is always “it depends…” but the decision process will get you started selecting the right approach. The layout of the viz matters. And as it changes, you might need to change your calculation type. There are scenarios where different solutions perform differently—depending on the volume and complexity of your data, the complexity of the question, and the required layout. There are always tradeoffs to consider (performance vs. flexibility, vs. simplicity). A good rule of thumb is that you can pick any two. For more information and examples, you can download the above workbook here. Thanks for posting this. 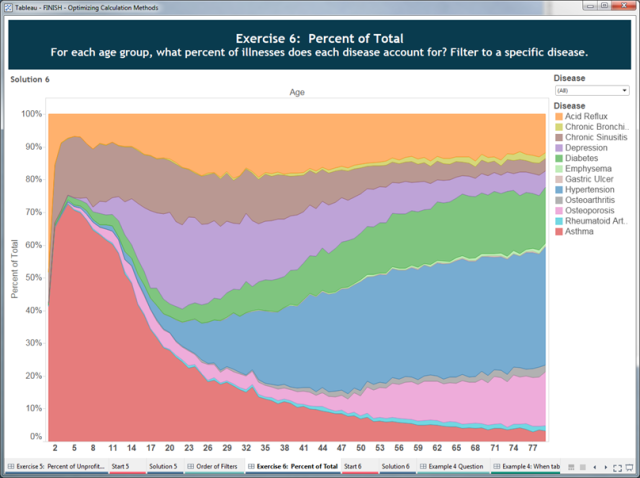 I love stuff like this because it shows how much I really still have to learn about using Tableau. I might be missing something, but for exercise 4 in the deck, the "Start 4" workbook uses a different data set from the "Solution 4" workbook. Both only have rows from 2014 & 2015, but the solution data set goes from Jan 1, 14 through Sep 25, 15 and the Start 4 data goes from Sep 8, 14 through Sep 8, 15. Am I missing something in how I'm supposed to match the solution? Excellent article! I might have found a typo, where you used INCLUDE and probably meant FIXED. See the calculation in the second paragraph from the bottom of #2.